Held at Meeanee Speedway on 17 November, Round Three of the Burger King Pro Dirt Super Saloon series was well overdue at the venue after having been rained out the last two events and the drivers were eager to get hold of the track — with no rain clouds in sight, everyone was treated to some stunning summer weather. The clay based track boasts 400m long straights that are 8 metres wide, while the corners widen out to 10 metres, making for enough room for tight passing. Drivers Mark Osborne and Lance Jenning have been winners here in 2015 and 2016. First up was the hot laps, a chance to test the cars and make sure the transmitters are functioning, which then leads into the time trials to see who is the fastest on the night. Mark Osborne (3NZ) clocked in a 16.0047 to be the fastest, though unfortunately he wasn’t able to get the monkey off his back after leading for over half the race — even passing the back car — where the power-steering gave up the ghost, putting the car into the wall. Two weeks prior, at BayPark, Dan Corrin (124M) suffered a blown engine in his brand new car, although good friend Steve ‘The Maori’ persuaded everyone to get into the charitable mood by donating $50 which would see your name on the car and it went off! Different drivers donated merchandise to be auctioned off, and one driver even donated a spare engine allowing Dan to get back at it. While the car sounded great, it wasn’t Dans night, finishing 19th. Steve (5B) and Grant (6B) Flynn were running on their home turf and were picked to be favourites for the night. Grant would take 4th while brother Steve came in 6th. 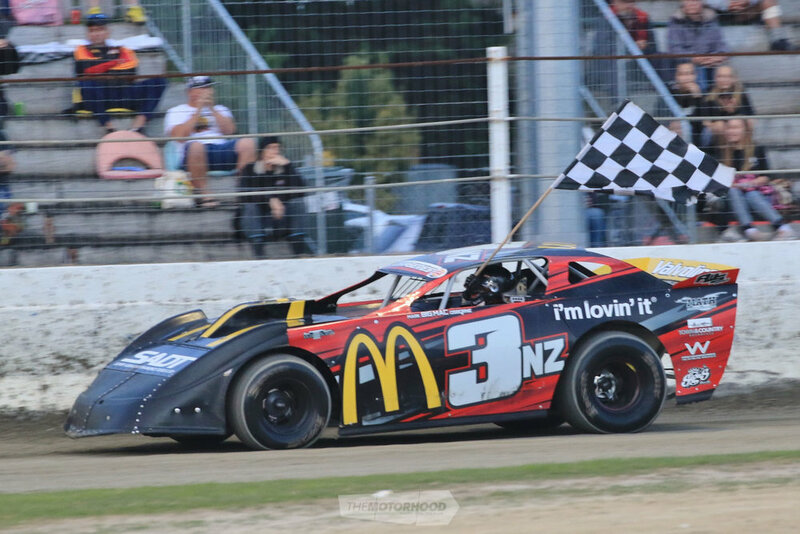 Perhaps the most well travelled competitor of the series, Cromwell-based Campbell McManaway is a former NZ Champion, Saloon Grand Prix winner, and three time North Island Saloon champion. He placed second in the Pro Dirt Series last year. 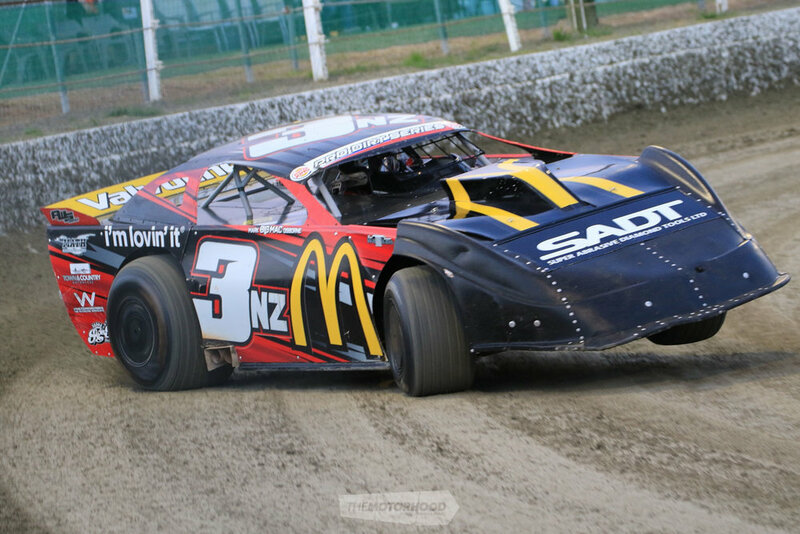 Steve Cowling (37M) would prove the eventual winner for Round Three, pocketing a cool $1000 for his impressive driving. Steve finished 5th in the points last year, earning Rookie of The Year, and hopes to climb the ladder even more this season. Sam Waddell came home in second, while Scotty Hayway took third.